Before in-home heating systems and electric blankets became widespread (or even invented for that matter), there were plenty of people living in Arctic environments that needed to stay warm. Anyone who lives in Alaska during the winters knows that even with modern amenities, it’s no easy feat, so how did Alaska Native groups stay toasty hundreds of years ago? Depending on the region they lived, they actually created just the right gear to face the elements. A strategy that holds true to this day: to stay warm, dress in layers. 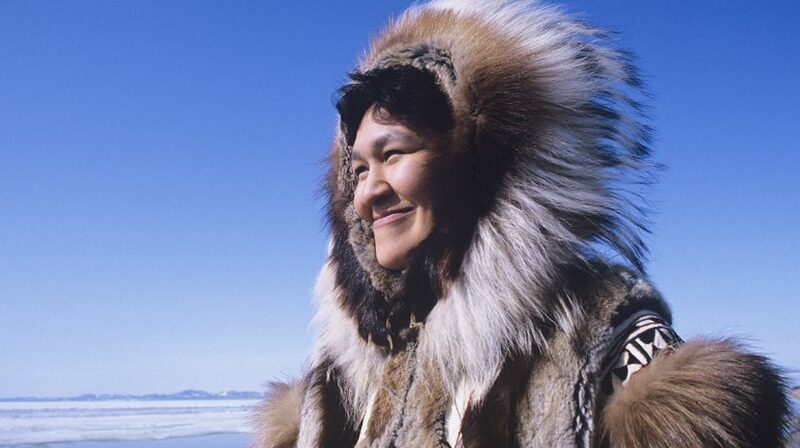 Many traditional clothes were made from caribou skin, with the fur still on for warmth. On the inner layers, the fur would face in and on the outer layers it would face out, providing the wearer ultimate warmth. The kuspuk, a hooded dress/hoodie hybrid made from lightweight cloth, was another layer to work with. It was traditionally made to be knee length with a large pocket in the front. For footwear, mukluks, a boot made from reindeer or sealskin, could be adapted to many different climates. Athabascans also used caribou hide, as well as moose hide, for clothing, and removed the fur in the summer for lighter versions of their winter staples. A cozy version of snow pants was created from caribou-hide pants with attached moccasins. The skins from snowshoe hares were also used for thinner layers to wear under the heavier parkas. Athabascans adorned their clothes with beautiful beadwork and decorations made from porcupine quills, feathers and fringe. Alutiiq and Unangax peoples, from Alaska’s Aleutian chain, needed their clothes to be waterproof, above anything else. For waterproof gear, the intestines of aquatic mammals made for the perfect material. Clothes made from skin and gut were sewn extremely tightly so as not to let any moisture pass through. Yup’ik and Cup’ik groups in Southwest Alaska traditionally used bird, fish and marine mammal skins for clothing for their tough, waterproof qualities. They also used grass for a waterproof sewing thread and for woven socks. Mountain goat wool and cedar bark were used in the Southeast areas by the Eyak, Tlingit, Haida and Tsimshian cultures. In this wet rainforest climate, hats were a must and were made from spruce roots and cedar bark. By taking the resources made available by the surrounding land and sea and turning them into high-quality garments to protect from the elements, Alaska Natives created wardrobes that are still used to this day. Flash forward to today and you’ll still see traditional clothing such as kuspuks, mukluks and more worn year-round. What kept Alaskans warm hundreds of years ago is still a fantastic way to fight the cold, and look great while doing it.